Villa 104 is situated on a quiet estate on the edge of the Gauarres Mountains, above the small town of Santa Cristina d'Aro. It enjoys a spectacular southerly view across a wide valley to the L'Ardenya Mountains and the Mediterranean Sea. At night the lights of Sant Feliu de Guixols and S'Agaro shimmer on the horizon. The villa was built in 2003. Upstairs are two double bedrooms and one twin bedroom, two of which have balconies with beautiful views. The main bedroom has an en suite bathroom. The other two bedrooms share an adjacent bathroom. Downstairs is a large kitchen, dining area and toilet. The living room opens out onto a covered terrace, again enjoying wonderful views. There are steps down to an 8 x 4 metre secluded pool that is ideal for private sun bathing and simply relaxing. The back garden and pool are totally private. The nearest restaurants, shops and beautiful beaches are a short drive from the villa therefore a car is essential. Golf details: Catalonia is one of the best possible destinations for golf enthusiasts offering 36 courses in perfect conditions on which to play all year round. Two of these fabulous courses are within 10 minutes drive of the villa. The Club de Golf Costa Brava is immersed in the landscape of the Emporda and can be seen from the Villa. The Club de Golf d'Aro (Mas Nou) winds its way through pine and cork forests with amazing inland as well as coastal views. ( We have played this one! Every hole is interesting. Stunning views. A good course but not a challenge length wise). Don't forget that the P.G.A. Golf de Catalunya (20 minutes) is one of the ten best courses in Europe and Emporda Golf (40 minutes) boasts 27 of the best golf holes in Spain. Sea Activities and Skiing: The diversity of coastline enables all water sport activities - visitors may wish to try swimming, sailing, water skiing, windsurfing, kayaking and snorkelling. The ruggedness of the Costa Brava continues under the sea to provide some of the best diving in Spain. In some spots remarkable crimson coral still thrives. Approved tourist diving centres with certified instructors operate at a dozen or more places. Five resorts, four for alpine and one (Guils de Cerdanya) for cross-country skiing make up the range of winter sport options in the Pirineu de Girona. La Molina, Masella, Vall de Núria (2 hours) and Vallter 2000 (1 hour 45 minutes) have now become skiing classics in Catalonia, at a time of a real leap forward due to improved services and facilities, & areas like Alp 2500 which, thanks to the connection between La Molina and Masella, can offer the largest skiable area in the Pyrenees, with a surface area of 100 kilometres. Natural Areas and Culture: In the Girona province, the natural parks of the Garrotxa Volcanic Area, Cadi-Moixeró, Cap de Creus, Montseny and the Medes Islands are spectacular areas of unique natural beauty. Nowhere as here has the power of nature shown itself so varied and full of subtlety. Protected natural areas account for 30% of the surface area. Archaeology: The megalithic monuments of the Albera mountain range, the Serinyà Historic Caves Park, the Cova d'en Daina dolmen in Romanyà de la Selva, the Iberian settlement at Ullastret and the Greco-Roman city of Empúries are millenary testimony that has still the power to surprise and move visitors. Museums: The art and universal spirit of Salvador Dali head up a list of offerings that must inevitably include the Dali Triangle (the Dali Theatre-Museum in Figueres, the Portlligat Museum-House in Cadaqués and the Gala Dali Castle in Púbol); Girona's Archaeology, Art, History, Cathedral and Cinema Museums; the Toy Museum of Catalonia, also in Figueres. Bath towels provided. Please bring own beach towels. A large light living room with all the amenities required. A well equiped kitchen for the sole use of the villa. The kitchen dining area and the terrace dining area (with beautiful views) both seat 6 people. Two bedrooms have balconies with stunning views. The main bedroom's balcony is suitable for private sun bathing. A covered terrace with stunning views. A lovely, private pool for relaxing, sun bathing and swimming. Cushions for the sun-loungers are not provided. The pool is unheated so it is not usually in use between October and early May. 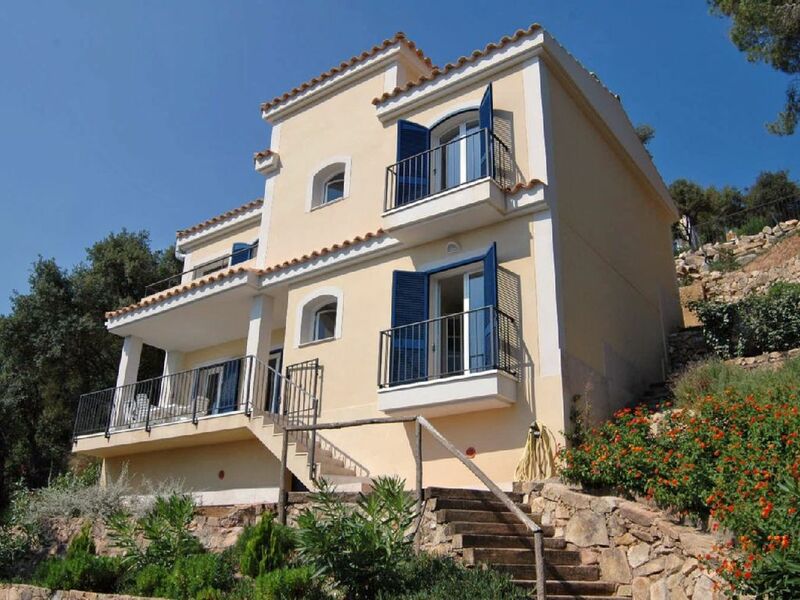 great house and location with lovely elevated long distance valley and sea views . The house is well maintained and clean . Comfortable with a lovely pool and setting amongst cork oak woodland . The best bit is the view from all rooms long distance over the valley to other hills beyond and the sea to the north east. Really enjoyed the trip ; the area is lovely with plenty of historic and natural interest. This is a stunning villa in a stunning location. My family and I could not have asked for more! The pictures do not do the villa justice. We are a family of four with two young boys who loved the villa and pool. The place is superbly equipped, comfortable and clean. The views and location are stunning. It is a beautiful area with lovely beaches, villages and scenery. We were happy staring at the views all day! We will definitely be returning. Villa sharming , has everything we need. Pool - great size , St.Pol - wonderful sea and coastline ! Amazing views and unique experience!Everything was perfect, it is a pity that the vacation is just two weeks. We needed a break and just wanted to get away from it all. This place was the ideal location for this. The house is beautiful, clean, comfortable and the kids loved it. The location and the views are amazing with loads of fresh and clean air and the neighbourhood was very quiet, which is what we wanted. The weather was great for the time of year ( it was sunny everyday of our one week stay), but not warm enough for us to use the pool. Instead we went out and about to make the most of the beautiful views. Our favourite places include the walk from San Pol beach at S'agaro, Girona and Barcelona (especially Camp Nou and Sagrada Familia). Driving through the Pyrenees on the way here was also an amazing experience. We have fallen in love with Catalunya and there is so much more to see and do! we are already talking about our next visit to this region and hopefully the villa. With several sets of friends, I spent four weeks in this well-maintained and furnished villa that was even more inviting than the accurate listing suggests. Although a car is rather necessary, many of us managed the climb to the top of the urbanization (2+ km, 10% average, last km 15%, a few bits of 20+%) by bicycle, but we had to work! The payoff is the delightful view over the valley below, some mornings with a river of fog! With an excellent grocery store in Santa Cristina d'Aro below (along with other wonderful shops and restaurants), the sights and sounds and smells and tastes of the coastal towns and interesting inland locations are all relatively close. From Villa 104, we explored by car, bike, and, of course, by foot the many wonders of Costa Brava and Catalunya, as kindly outlined by Emma, the easy-to-work-with owner. (Natasha and Herman provide another appreciated service on-site, all contributing to my memorable experience.) We were always happy to return from our days to this modern, well-equipped and terraced property proudly . . . or just spend the entire day there relaxing! It's all good! Your stay in this part of Catalunya will be memorable for my reasons (food, wine, cycling, vistas, markets, shops, meeting people, etc. ), but one reason is your choice of villa rentals. I am confident that I chose well; I hope to do so again soon! The villa sits at the top of 'Les Teules' which is a quiet development of individual properties following a steep, winding road. At the bottom of the hillside is Santa Cristina d'Aro which provides the nearest shopping facilities. Within a 10 minute drive you can explore Sant Feliu de Guixols which is a typical fishing town set in a beautiful bay. The nearby beach of S'Agaro is full of charm and boasts some of the most exclusive properties in Spain. Slightly further north, Platja d'Aro offers a livelier atmosphere and a vast array of restaurants. The villa allows an easy drive to explore much of the beautifully rugged coastline and hidden coves...Calella de Palafrugell , Aiguablava and Tamariu are just a few of the spots not to be missed. The local area offers much more than just an amazing coastline. Barcelona and Girona are within an easy drive and the surrounding mountains supply endless walks. The tourist office provides excellent information on a multitude of other activities. Damita PMC are the Property Management Agent for Villa 104. Prices include meet and greet service, information and assistance provided if needed during your stay, departure checkout, cleaning, laundry and pool maintenance.